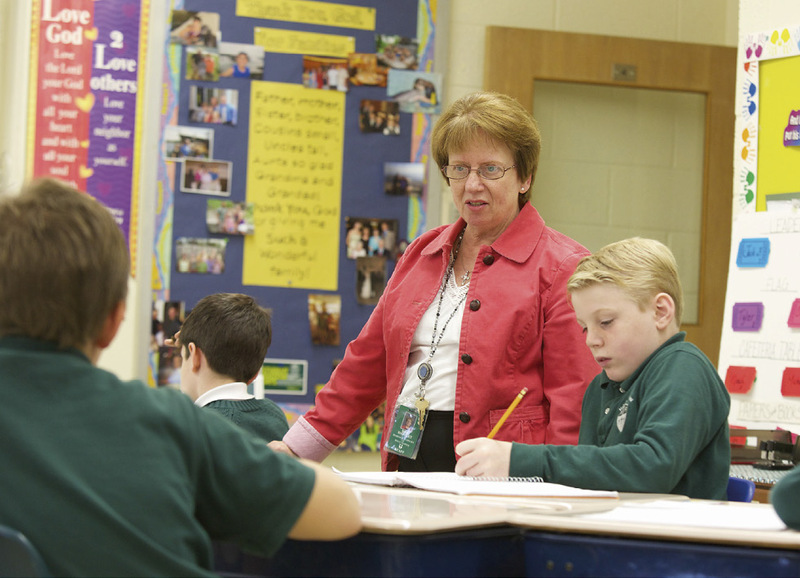 Sixth grade teacher Carol Shifflet holds class at Holy Family School in Syracuse. Carol Shifflet has taught her students many important lessons over nearly four decades of teaching at Holy Family School in Fairmount, NY. One of the most important, however, is quite simple: trust her. This kind of insight is one that only comes from experience. Shifflet gained hers within the walls of Holy Family. In 1974, the new college graduate was eager for any job that would put her in a classroom, especially at a time when teaching jobs were scarce. “When Sister Rosaline from Holy Family called to offer me a job teaching 5th grade, I jumped at the opportunity and was grateful for it,” she said. Shifflet didn’t necessarily intend to spend her entire teaching career inside one school — no less a Catholic school — but, looking back, she knows it was the right decision. This school year marks Shifflet’s thirty-sixth at Holy Family, having taken three years off when she had her son. The veteran teacher has lost track of how many children have passed through her classroom doors since she began, but she is often reminded of the impact she’s made when former students greet her in the grocery store or stop into the school to say hello. Some even come to Meet the Teacher night — as parents of her current students! While the day she first walked into Holy Family School seems like a lifetime ago, Shifflet has no plans to retire. She will continue to serve as a trusted teacher and a true example of the satisfaction that a career in Catholic education can bring. Caroline K. Reff is a freelance writer in Syracuse, NY, and editor of Pillars magazine.